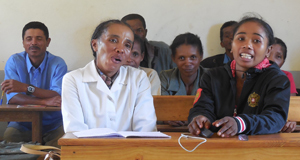 Men and women in 800 communes (or municipalities) throughout rural Madagascar are now more knowledgeable, effective advocates for their own health care, thanks to IntraHealth International and the Santénet2 project. Through the project, IntraHealth worked with local authorities in the Communal Health Development Commissions (CHDCs) to empower the Malagasy to be more involved in their own health care and to help the CHDCs better respond to their communities’ health needs. The project also provided training for over 11,000 community health workers in rural Madagascar. Madagascar is one of the poorest countries in the world. In 2010, 76.5% of its people were living below the poverty line of $1 per day. Maternal mortality is high and half of children under the age of five are stunted—an indication of chronic malnourishment. Political crises and a coup d’etat in 2009 have only made matters worse by destabilizing the health system and limiting citizens’ access to high-quality health care. But even during such uncertain times, communities can have the power to make sure their health needs are heard and addressed. Using the IntraHealth-developed social quality approach, Santénet2 project staff worked to bolster and strengthen the CHDCs through better planning and training. This allowed the CHDCs to organize meetings where locals could gather with CHDC officials—usually at a village chief’s house or outside a health hut—to talk about the problems they encounter when they seek out health care. One common holdup, they said, was stockouts, or shortages of medicines and family planning supplies. Another was staff absences—particularly irksome to clients who had just walked great distances or missed work to make the trip. Women said they wanted to be able to consult midwives at primary care centers, rather than just male physicians. Young people said they needed greater access to adolescent reproductive health services. And other clients wanted to see health workers perform demonstrations when they were giving advice about nutrition—how to cook certain foods for young children, for instance. Overall, almost 1 million people took part in the community meetings. More than half were women. Madagascar’s rural population—80% of its people—is generally less informed about health services, and the meetings have helped to remedy that. The Santénet2 project and the CHDCs also worked with local health workers—called community health volunteers—to make sure they had the right training and to develop ways to respond to the community feedback. CHDC members conducted self-assessments, identified key areas for improvement, developed timeframes for the changes, and put specific members in charge of each component. They also constructed or refurbished some 3,552 rural health huts to give community health volunteers a confidential setting in which to see and care for clients. Over the course of the project, assessments showed that community satisfaction in the services provided by community health volunteers rose 24% for patient management, 39% for availability of medicines, and 76% for the environment in which community health volunteers care for clients. Community responsibility is a key part of Malagasy culture. That’s one reason the social quality approach is successful there—community members want to have the power to ask for the services they need, and health workers and local authorities take their responsibilities to the community very seriously. Project results showed that the more involved the communities were, the more competent the community health workers became. And not only has the approach resulted in higher quality and greater use of services in Madagascar—it has encouraged greater gender equality as well. The community meetings have given Malagasy women a place to talk specifically about their own health needs and pulled them into conversations and decision-making processes they haven’t traditionally been a part of. And through both the community meetings and the work of the CHDCs, men have become more engaged in family health issues, as well. While the social quality approach was designed to be sustainable in Madagascar, upcoming elections and political instability could make it difficult to sustain as well as to expand the approach to the 766 other communes across the country. Still, project staff say, scaling up to a countrywide approach would instill a new understanding in Madagascar that poor health is not inevitable. The social quality approach is based on IntraHealth’s Partenariat pour l'amélioration de la qualité (or PAQ) approach, which was first developed in Rwanda and has been adapted to the Malagasy context. The Santénet2 project used IntraHealth’s Learning for Performance Approach and supportive supervision to train Malagasy community health volunteers. The project, which ended in June 2013, was funded by the US Agency for International Development and led by RTI International.